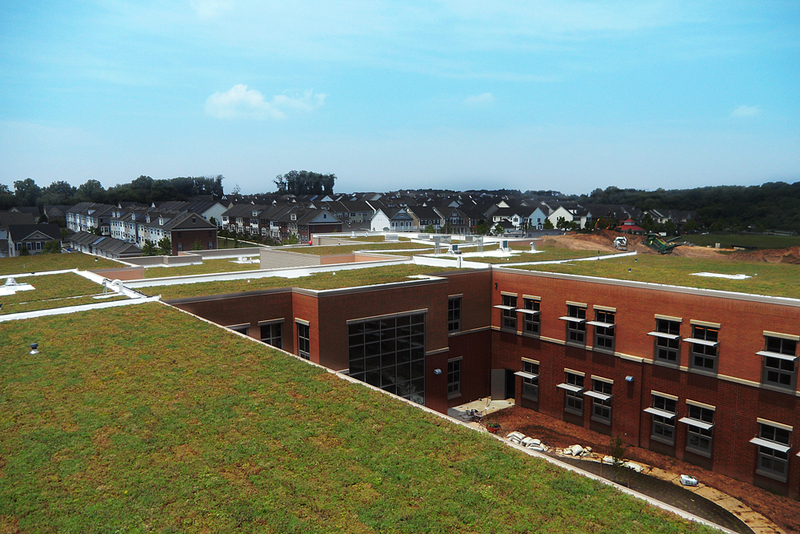 The Wilson Wims Elementary School, Clarksburg, Maryland opened for the 2014-2015 school year and was designed by architects Grimm & Parker to be a model “green school.” The school was awarded LEED Gold certification in February 2015. Constructed by Hess Construction, the school’s environmental and sustainability features include daylighting in learning spaces, biofilters and rain gardens, a living roof, geothermal heating and cooling, sustainability-forested wood, regional and recycled materials and significant water savings. 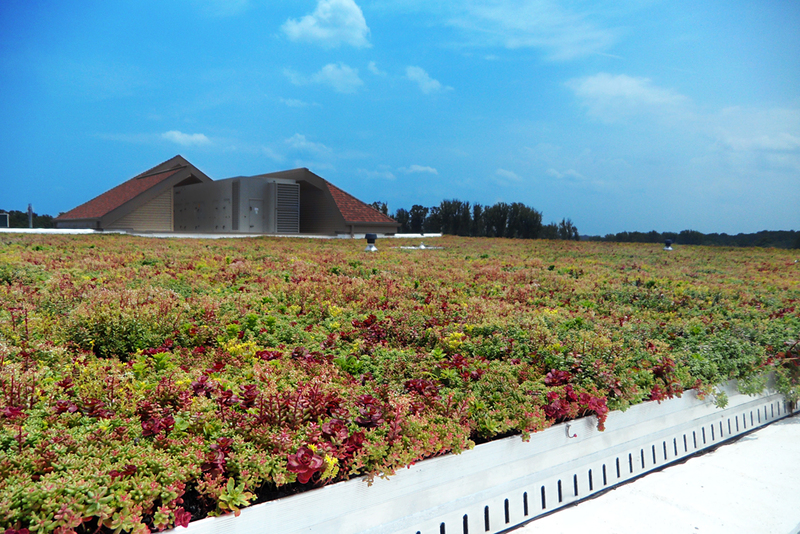 The 38,000 square-foot vegetative roof was installed by Interstate Corporation. Montgomery County Public Schools, the largest school district in Maryland and 17th largest in the nation, are seeking LEED certification for new and remodeled school facilities. LEED – Leadership in Energy and Environmental Design – is a national green building standard developed in the U.S. Green Building Council. MCPS has 21 schools certified as Gold and one school certified as Silver. CALGARY, AB — August 20, 2015 —Britannia Crossing located at 5119 Elbow Drive SW, is the new home to a large green roof located on the third floor surrounding the outdoor play area of one of its tenants, Kids and Company. The living roof was installed this summer and completes an enviable list of environmental and health-friendly building features, with the goal of attaining LEED Gold certification. The five-story, mixed-use building is also home to OPUS Corporation its owner, Browns Socialhouse, Café Artigiano and a number of other retail merchants and office tenants. In addition to the green roof, the building also has solar panels, uses low emitting materials, a green cleaning policy, green power initiatives, regional and recycled materials, a hybrid company car and many more initiatives to create a sustainable environment. “We have also gained an increased understanding of the operation and management of the LiveRoof system for more projects down the road,” Kovac continued. Eagle Lake Landscape Supply custom grew the 2,000 sq. ft. vegetative roof using locally sourced plants and soil in recycled plastic modules. The green roof was delivered fully mature, and the LiveRoof installation was performed by the Skyline Group, of Rocky View, AB. Green roofs provide nature function and beauty. A patented, subterranean modular system unites the soil and plants creating a naturally beautiful meadow-like aesthetic. The roofs provide aesthetic, environmental and social benefits. As spring finally arrives in central Ohio, students at New Albany-Plain Local Schools will have new R’s to study: a rooftop garden and rooftop greenhouse. New Albany, OH April 6, 2015 — With the completion of the New Albany-Plain School District’s new 1-8 school and the arrival of warmer weather, students and staff will soon have an opportunity to explore the district’s newest learning lab, located on the school’s roof. 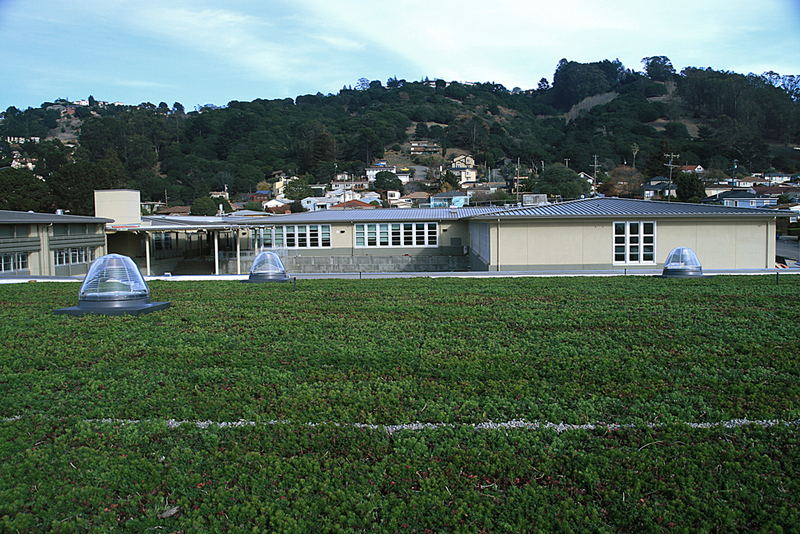 To keep this vision growing, district leaders and community members through the design process chose to incorporate the LiveRoof® Hybrid System (https://www.liveroof.com) and a greenhouse into the plans for the new school building as it was designed in 2013. The 2500-square foot garden was designed by the architectural firm Moody Nolan and installed by Meade Construction. The living roof features native plants grown by Corso’s Perennials. The planted roof will also provide opportunities to explore native plants and conduct soil testing, Willmore added. Protecting local waterways by absorbing and filtering rainwater. LiveRoof systems can influence several Leadership in Energy & Environmental Design (LEED®) credits, including sustainable sites, water efficiency, energy and atmosphere, materials and resources and indoor environmental quality. Better Stormwater Management: Immediate stormwater runoff reduced by 50-90 percent. 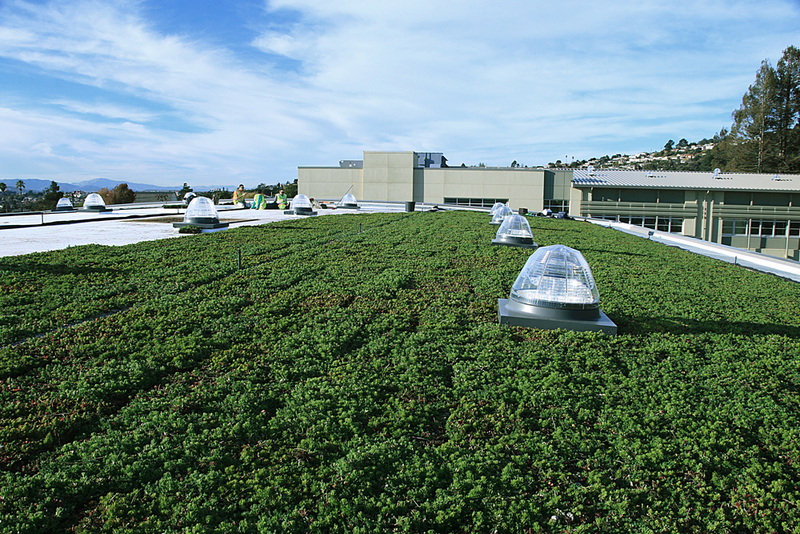 Green roofs filter rainwater water and act as a buffer against acid rain. 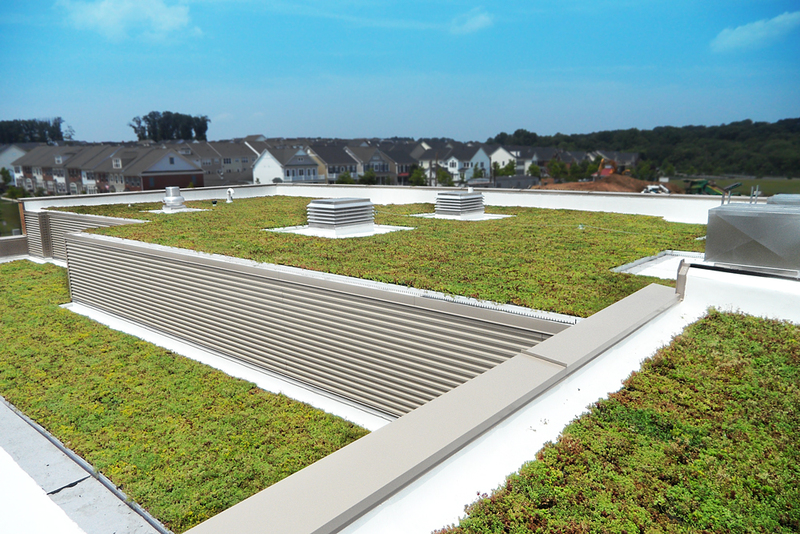 Longer Roof Life: Plants and soil serve as a protective shield and prevent UV radiation from degrading roof components. Fewer cracks and leaks. Waterproof membranes can last 200-300 percent longer. Energy Conservation: On a sunny 95°F day, conventional rooftop surfaces can hit 175°F. 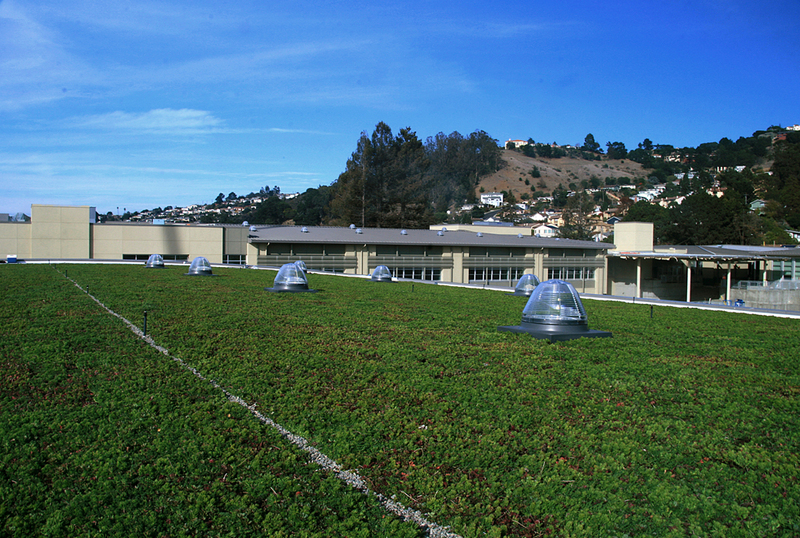 By shading and insulating the rooftop, green roofs bring these temperatures in line with the ambient air temperature. They reduce indoor temperatures and energy consumption, especially for air condtioning in summer. That decreases costs for building owners. Interior Noise Reduction: Lower indoor sound levels, as much as 40 decibels. Urban Heat Island Effect Mitigation: Plants release oxygen and evaporate water. Green roof soil also evaporates water. That makes a green roof function like an evaporative cooling system. The combination of the umbrella effect (shading and insulating) and evaporative cooling moderate temperatures at street level. Improved Air Quality: Every one square foot of green roof can filter about seven ounces of dust and smog particles per year. And through the process of photosynthesis, plants covert carbon dioxide, water and sunlight/energy into oxygen and glucose. This results in reduction of greenhouse gases in the atmosphere. Enhanced Aesthetics: Green space is visually appealing and inviting. People feel better and are more productive when they have a natural view. Barren rooftops become habitable spaces with walkways, patios and seating and thereby add useable space to buildings. Increase in Return on Investment (ROI): On average, 9.9 percent for new buildings and 19.2 percent for retrofits. The Green Schools exhibit will be introduce schools throughout the country which have installed green roofs on their buildings. Riverbend Nursery also donated modules for the new Green Schools Exhibit called Sprout Space™ at the National Building Museum. The entire Exhibit features a range of K-12 green projects and demonstrates green school design possibilities. Visitors will be able to touch, feel, and see the green features of a Sprout Space™ classroom. The LiveRoof modules donated by Riverbend Nursery and LiveRoof® will include a mix of drought-tolerant plants grown specifically for use in on rooftops in Washington D.C.’s climate. The modular classrooms offer a cost effective and healthy solution for new school construction. Situated on over 100 acres in Riner, Va. in the beautiful Blue Ridge Mountains, Riverbend Nursery is a progressive container grower of quality perennials, herbs, groundcovers, and ornamental grasses. A wholesale-only grower, Riverbend sells to independent garden centers, landscapers, and distributors in the Mid-Atlantic and Southeastern United States. Riverbend grows more than three million containers annually with over 1,200 varieties, produced in both heated and unheated greenhouses. The majority are propagated at the nursery facility from seed, cuttings or divisions. As a LiveRoof® licensed regional grower, Riverbend is committed to providing unsurpassed service to green roof customers in the District of Columbia, North Carolina, Virginia and parts of both Maryland and West Virginia. More information is available at https://www.riverbendnursery.com. Based in Spring Lake, MI, LiveRoof®, LLC (www.liveroof.com) is the top horticultural science company in the green roof industry. Exceptional in design and function, the LiveRoof® Hybrid Green Roof System is the most refined horticultural solution. LiveRoof® establishes a healthy, sustainable ecosystem that covers the rooftop with seamless vegetation. Licensed regional growers customize plant selection for every LiveRoof® project. They deliver the system’s modules abundantly vegetated with locally cultivated, full-grown plants for an instant green roof and trouble-free ownership. LiveRoof’s® natural function and natural beauty offer the highest level of green roof performance with ultra-low maintenance costs. The proof is on the roof — showcased in over 800 installations that total more than 3 million square feet. Gary Comer College Prep designer John Ronan Architects was awarded a 2011 Annual Design Review Citation. Gary Comer College Prep has been recognized by the 2011 Annual Design Review. The project earned a Citation in the “Grow” category. The Chicago project was designed by local firm John Ronan Architects. The green roof was designed by Hoerr Schaudt Landscape Architects, also a Chicago design firm. Gary Comer College Prep was also honored this year by the AIA Chicago’s Distinguished Building Awards. Two buildings earning 2011 Distinguished Building Awards from AIA Chicago are topped with LiveRoof® brand hybrid green roof systems. One Haworth Center, designed by Perkins + Will, received an an Honor Award. One Haworth Center, designed by Perkins + Will, received an Honor Award. The building features a 45,000 SF green roof that peaks at 3 stories and slopes to meet the landscape at ground level. Gary Comer College Prep, designed by John Ronan Architects, received a Citation of Merit. This literally green building has a spring green colored exterior and is topped with a 11,400 SF LiveRoof brand green roof system. Chicago-based Hoerr Schaudt Landscape Architects designed the green roofs on both buildings.